It’s not an easy time to be a material handling manager. Aside from whatever specific day-to-day you-know-what gets shoveled on you from the top and bottom of the supply chain, you have every trade mag and organization that enters into your purview telling you how safe and productive robots are, while your human workers, who always seem to have a sick kid, need breaks and certainly cannot be controlled remotely, if at all. Then your most dependable worker, whose been hauling for you for several years throws his back out while attempting to move a one-ton cart. So, you go online to price automated lift trucks and realize that the upfront investment, which has a few too many zeroes at the end, is just too much right now. Fortune favors the bold, but not the reckless. On the other hand, it’s not ethical or practical to risk injuring workers to safeguard company profits. It costs about $7,000 to replace a warehouse worker (due in part to training new hires and lost productivity), according to logistics provider Kane. The Power Pusher gives anyone the ability to push or pull up wheeled loads of up to 50,000 lb. 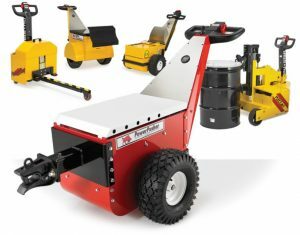 The signature Power Pusher, energized by a 24-vdc, 400-w motor, allows workers to push or pull loads ranging from 500 to 50,000 lb. So even for an aging workforce not as spry as it used to be, the job will get done sans the back spasms and $90,000 surgery. And unlike with lift trucks, any employee can operate them. “Power Pushers fall under different classification, so you don’t need a certification or driver equipment like you do a forklift,” Blesi says. Certification isn’t incredibly time-consuming, but does take planning and resources. Training shall consist of a combination of formal instruction (e.g., lecture, discussion, interactive computer learning, video tape, written material), practical training (demonstrations performed by the trainer and practical exercises performed by the trainee), and evaluation of the operator’s performance in the workplace. Click HERE for the full OSHA requirements. Training to use a Power Pusher is much less complex. It’s about as easy as using a self-propelled lawnmower, with the controls at your fingertips, and the programmable control system allows the user to adjust speed and acceleration for different loads. “They give you the freedom and flexibility to use the equipment in different areas, and to go into unpaved areas, inside or outside,” Blesi says. The concept has been around since the 1970s, with the electric motor added in the 1990s. Aside from preventing musculoskeletal injuries, substituting lift trucks for a manually steered pusher will decrease the likelihood of accidents. Statistics point to 11% of all lift trucks in the U.S. being involved in an accident, hence the reason why many are opting for automated versions. “Safety has always been a concern and it’s probably more of a concern these days,” Blesi says of Nu-Star’s primary modus operandi. Nu-Star offers several different models based on weight, load, and environment.